Reading and share top 15 famous quotes and sayings about Flaws And Beauty by famous authors and people. 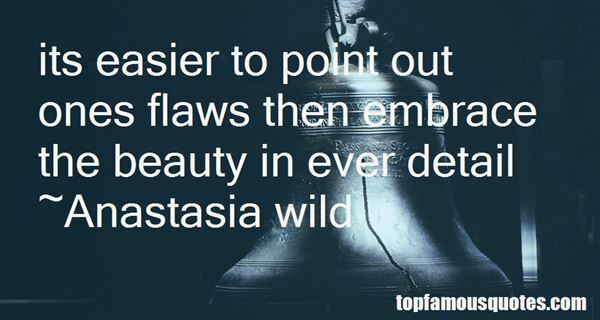 Browse top 15 famous quotes and sayings about Flaws And Beauty by most favorite authors. 1. "Its easier to point out ones flaws then embrace the beauty in ever detail"
2. "The beauty in correcting our own mistakes; rather than attempting to correct the mistakes in others, is that working upon our own flaws improves us. 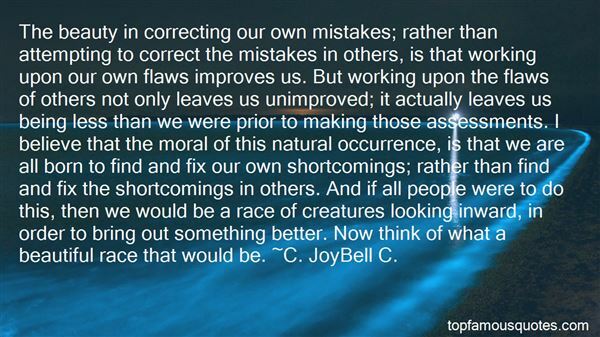 But working upon the flaws of others not only leaves us unimproved; it actually leaves us being less than we were prior to making those assessments. I believe that the moral of this natural occurrence, is that we are all born to find and fix our own shortcomings; rather than find and fix the shortcomings in others. And if all people were to do this, then we would be a race of creatures looking inward, in order to bring out something better. Now think of what a beautiful race that would be." 3. "History's best thinkers eventually concluded that our flaws were too powerful to trust with freedom. Thus we've been groomed as hamsters in a wheel that benefits a laughing few. No more great works will be accomplished under the regime, because beauty is not democratic or profitable." 4. "He is power and poetry, grace and perfection, and I feel my body tighten in response to the beauty that is Damien." 5. 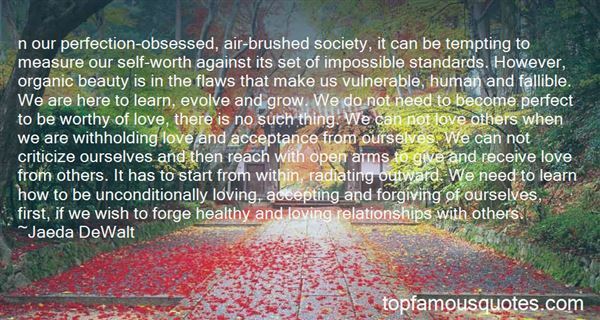 "N our perfection-obsessed, air-brushed society, it can be tempting to measure our self-worth against its set of impossible standards. However, organic beauty is in the flaws that make us vulnerable, human and fallible. We are here to learn, evolve and grow. We do not need to become perfect to be worthy of love, there is no such thing. We can not love others when we are withholding love and acceptance from ourselves. We can not criticize ourselves and then reach with open arms to give and receive love from others. It has to start from within, radiating outward. We need to learn how to be unconditionally loving, accepting and forgiving of ourselves, first, if we wish to forge healthy and loving relationships with others." 6. "The more we narrow the definition of beauty, the more beauty we shut out of our lives." 7. "If in my youth I had realized that the sustaining splendour of beauty of with which I was in love would one day flood back into my heart, there to ignite a flame that would torture me without end, how gladly would I have put out the light in my eyes." 8. "Putting it negatively, the myth of eternal return states that a life which disappears once and for all, which does not return, is like a shadow, without weight, dead in advance, and whether it was horrible, beautiful, or sublime, its horror, sublimity, and beauty mean nothing." 9. "I first fell in love with music when I was a little boy. When I first heard music, I felt the beauty in it. Then, being able to tap along on a table top and box was great, but my favorite thing to do was to watch records spin. I would almost get hypnotized by it. These things are what drew me in initially." 10. "That's all I've ever dreamed of, Mr. Bones. To make the world a better place. To bring some beauty to the drab humdrum corners of the soul. You can do it with a toaster, you can do it with a poem, you can do it by reaching out your hand to a stranger. It doesn't matter what form it takes. To leave the world a little better than you found it. That's the best a man can ever do." 11. "The beauty of cable is you could program for 18-year-old twins and get a hit show on cable." 12. "It's such an ugly time, beauty is the real protest." 13. "You are my favorite song; a rhythm of beauty that captures my spirit." 14. "All the beauty that's been lost before wants to find us again"
15. "And how about the "Daily Odes to the Benefactor"? Who can read them without bowing his head reverently before the selfless labor of this Number of Numbers? Or the terrible blood-red beauty of the "Flowers of Judicial Verdicts"? Or the immortal tragedy, "Lat for Work"? Or the bedside book of "Stanzas on Sexual Hygiene"?" Going to work just looked crazy. Eating another meal, ever, made about as much sense as planting tulip bulbs in the shadow of a falling atom bomb."